Disclosure: I received a sample product to help facilitate the review. All opinions stated however, are genuine and entirely my own. 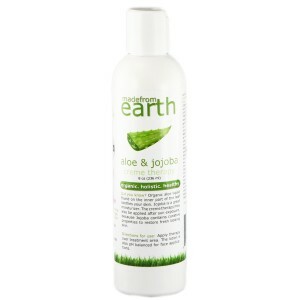 Made from Earth has a best selling item with their Organic Aloe & Jojoba Creme Therapy, and after using it, I can see why. It goes on nice and smooth, doesn't leave any residue behind, and absorbs quickly. It also leaves your skin feeling nice. My daughter tried it on her face yesterday and kept walking around telling us to feel her face...teens are funny like that you know. ;) I have to give her props though, her face was pretty soft. I prefer to use it on my legs. I've long been a fan of Aloe, and this creme works nicely to help combat the dry skin summer can bring. On the website it is noted that the creme contains highly concentrated volumes of Aloe Vera and Rooibos Tea Leaves. The former, according to the website, provides anti-bacteria and preservative properties, and the latter is a powerful antioxidant. Together they create a barrier to free radicals, limiting their potentially damaging effects on your skin. The Organic Aloe & Jojoba Creme Therapy is 100% natural and chemical free. You can also follow them on Facebook, G+, and/or Twitter. One lucky winner gets a bottle to call their own ($24.99 value). US entrants only. I learned that Jojoba is a liquid wax with qualities similar to skin, which is probably why it works so well. Too bad I cant be a part of them. I learned that one their website, you can learn about all the harmful ingredients that are in skin care products. Really scary stuff like formaldehyde which is in the highest class of known toxins that cause cancer! If I can figure out how to enter then I'm in. Sounds awesome. Learned that their products are free of harmful and toxic ingredients! Sounds like a good product. I've always loved aloe. I will have to enter, I'm sure I'd love this! Sounds great. As you know, I'm suffering from sun poisioning so this is exactly what I need! Aloe Vera and Jojoba are great ingredients so I am not surprised that this product is very good Rosey! Enjoy the rest of your Monday. Hello Rosey! Reads like a good product. I've always been a fan of aloe vera. I came across your blog on the "Linkin' With My Ladies" Blog Hop. I'm following you via Bloglovin'. Please follow me back. Thank you, and have a great week! Thanks for the giveaway! I love organic/natural products!! I learned that their products do not contain any nasty chemicals like sulphates. Might work on my skin too. Love aloe and natural is the only way to go. I would love to try the blueberry lip balm! My lips are always chapped year round and I go through a ton of balms! This is awesome product, I agree with Noelle, aloe vera helps to ease the sunburn. They are 100% Farmed and Sourced in the USA! Made from Earth is an organic, holistic and healthy supplier of organic body lotions, organic face creams, and, organic lip balms to meet your healthy skin care needs. I like their Rosehip + Hibiscus Facial Serum! I love that their products are chemical free. I learned that their products are free of harmful and toxic ingredients! I like that all of the products are free from parabens and other harmful ingredients. Rosehip + Hibiscus Facial Serum sounds nice! Organic Aloe & Jojoba Creme Therapy. I would love to try the Three Berry Daily Face Serum. This is my line of work and I must say they have excellent ingredients in all their products. I'm impressed! I learned that one their website, you can learn about all the harmful ingredients that are in skin care products. I'd like to try the Vitamin E + Citrus Body Wash. I like the Green Tea Toxin Cleanser.